Indian Expatriates Association Medan was formed on 9th March 2016. 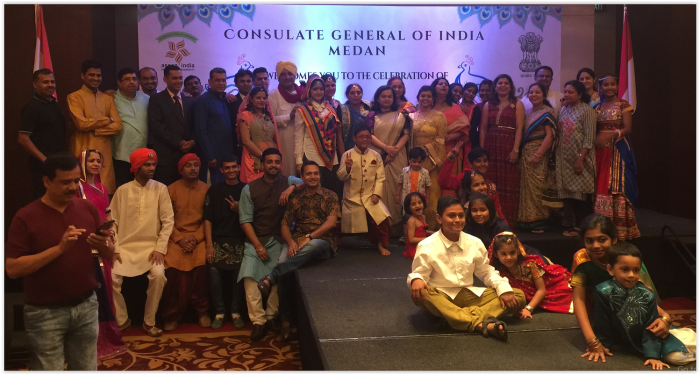 The association is recognized by The Consulate General of India in Medan. IEAM has achieved many milestones by active participation in Indian Cultural Programs, having a lot of Charity Activities, Connecting to the Local Indian & Indonesian communities. We have organized Cultural Events like Diwali & Holi, We also contributed in the Cultural events organized by CGI Medan on Diwali, Holi & also The National Day Programs like Independence Day, Republic Day & Gandhi Jayanti. We have done Charity activities with our own capacity & also in collaboration with CGI Medan & Dr’s Koffie Foundation like Donating 800 Kgs. of Rice to Victims of the Sinabung volcano irruption, Donating eatables to a local orphan house, Donating toys to the kids of weaker section of the society & few more activities like this. We have also organized some Indian Fashion shows for Kids. Last year at Republic Day, Our Fashion show “Unity in Diversity” showcasing the cultural dresses of various states under the leadership of CGI Medan, will always be remembered in the times to come. We have also organized Diwali Events in collaboration with various local Schools to showcase our Rich Indian Culture. We are thankful to Hon’ble Consul Genaral of India in Medan Dr.Shalia Shah for her continuous support to us. IEAM will always be committed to promote the image of India abroad.